If you look around the web, you’ll find hundreds of articles, blog posts, and opinions about sensory processing. Some are amazing resources for parents, teachers, and therapists. However, you can also find a lot of misleading information – not to mention the information that is downright false. 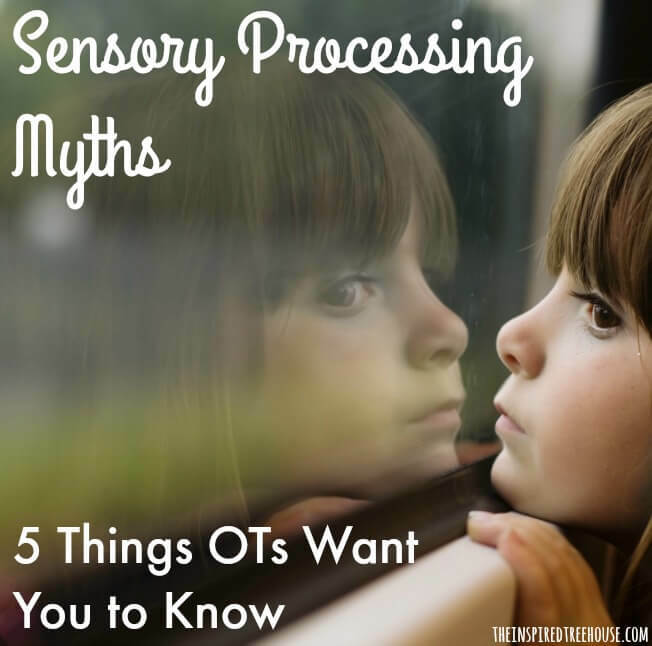 Let’s debunk some of the most common myths and misconceptions you might hear about sensory processing. MYTH #1: Sensory means getting your hands messy. TRUTH: Don’t get stuck on sensory play that appeals only to the hands! Kids experience the world using their entire bodies, so when you’re planning sensory play experiences, remember to get the whole body involved! Try all different types of activities, including ones that allow your child to explore how his body moves in space and how it works against resistance. For example, bowling with a light plastic bowling ball is a very different sensory experience than bowling with a heavy weighted exercise ball. Sure, your child can carry a ball with his hands, but can he carry it between his knees or elbows? Draw attention to sensory experiences during everyday life and play. Can your child hear Rice Krispies pop when you pour in the milk? Can he see baking soda fizz when you add vinegar? Remember to expose your child to play that engages all of the senses. Hearing, sight, taste, smell, movement, touch, and heavy work experiences. The idea is to form a healthy integration between ALL of the sensory systems so kids can listen, develop strong coordinated bodies, stay curious, initiate interactions in their environments and with their peers, and remain calm and focused so they can be at their best! MYTH#2: Sensory activities are so easy! You just set them up and the kids will know what to do! TRUTH: It is important for children to explore their environments independently to promote creativity and independent thinking. However, there can be benefits to guided sensory play too. Ask yourself if you would like the activity to have a specific purpose. To learn a motor skill? To learn to tolerate the feel of a texture? To engage and attend for a certain length of time? Or is it just to have fun? When your child encounters a sensory experience, it can be a wonderful opportunity to expose and build his sensory systems through different avenues of play. Model and demonstrate ways to play and interact with the materials you’re presenting. Pretend play is perfect here! Structure the activity so it has a purpose (to build something, to find something, to move from one place to another). Siblings and friends make great models too. Presenting unfamiliar activities in a group setting can bolster feelings of security and confidence and allows for greater interaction and expansion of play. 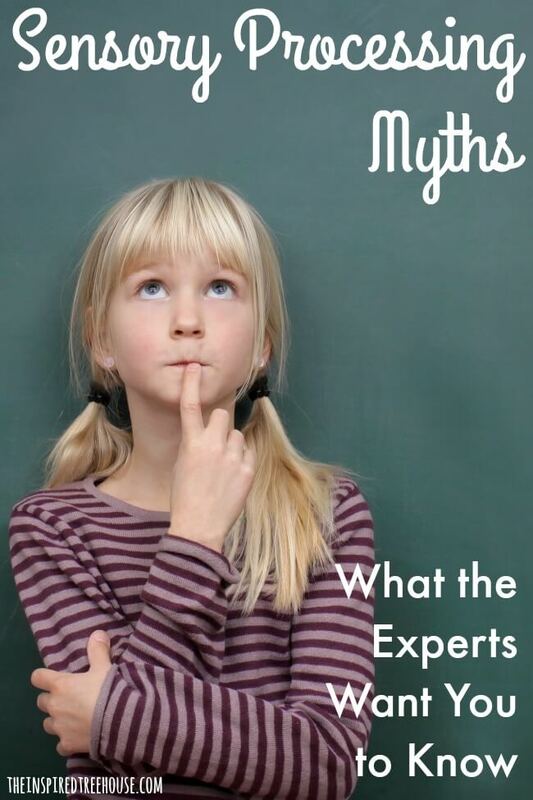 MYTH #3: All sensory activities are beneficial in the same way to every kid. TRUTH: Not true! Every kid is wired differently and will respond in his own unique way to the sensory experiences presented to him. Observe your child during his everyday routine and build sensory activities to meet his needs. Does he like to touch everything? Try building tactile bins into the play routine. Is he extremely sensitive to certain noises? Try gradually introducing a variety of non-threatening new sounds through toys and listening games. Does he get excitable and have trouble calming down? Think about adding in some calming sensory input – deep pressure, low lighting, soft sounds. Sensory integration is all about the individual child and what they need in the moment. Myth #4: If a child is cautious about participating in a sensory experience, just make them jump in and give it a go…they’ll like it once they try it! TRUTH: Allow the child to approach the activity himself, do not force it upon him. Let him watch first and adapt the activity to meet his needs. Gradually move from passive observation toward more active interaction with the sensory activity (e.g. if a child is reluctant to touch play dough, have him use utensils to cut and flatten it before trying it with his hands). Think of ways to make the activity less intense if the child is reluctant or more intense when the child is ready for a deeper sensory experience. Have a kiddo who can’t tolerate finger paint? Try it with a paintbrush first. Still too much? Have him hold your hand while you paint the picture. What about a kid who is super excited when he sees the finger paints? Take it to another level! Let him paint with his feet! Add a texture such as sand to the finger paints. Model for your child and let him see someone he loves and trusts engaging and having fun. Let him watch and keep the experience open for him to join in whenever he is ready. Keep in mind that the end goal of a sensory activity is for the child to have a strong, stable, and healthy sense of himself in his environment. MYTH #5: More sensory input is always better! TRUTH: Exposure to a variety of sensory experiences does support healthy development in kids. BUT there is such thing as overdoing it. KEEP IT SIMPLE. Try not to overwhelm kids by doing too much at once. Introduce sensory play gradually, one sensation at a time, watching your child’s responses and behavior. If he is enjoying himself, build on that and expose him to more. For example, start with simple tactile play in a rice bin. Does he enjoy it? Does it keep his attention? Next time around, add a visual component by tossing in some objects for your child to find. If this goes well, add some auditory input. What about incorporating a song or a rhyme that asks him to find a specific object? For example, sing Old MacDonald. The child can find the animals you have hidden in the rice as they’re mentioned in the song. Finally, add in a little movement by positioning your little one in a rocking chair while playing with this same activity! Subtle, gradual exposure. Does your child struggle with sensory experiences during his everyday routine? Some children need help from a professional, such as a pediatric occupational therapist, to overcome fears and learn how to process this sensory rich world we live in. Think for a moment about how much you touch, hear, taste, see, and move everyday. For a child with sensory processing difficulties who is unable to organize all of this input naturally, the world can be a very confusing, scary place. Seemingly simple tasks, like a haircut, a trip to the grocery store, or transitioning from one activity to another can be painful, alarming experiences (making them painful and alarming experiences for parents too!). 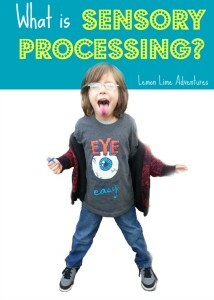 Be sure to hop over to Lemon Lime Adventures to read Dayna’s take on sensory processing! As a mother of a child with sensory processing disorder I appreciate your insight into this topic. Although I feel it really addresses the needs of a sensory avoided. My daughter is a classic seeker and I would appreciate some tips on keeping her engaged in a sensory experience. Thank you. Thank you so much for taking the time to read this post and for your thoughtful comment. We will definitely take this into consideration for our future posts on sensory processing. Many of our posts here at The Inspired Treehouse feature great movement and tactile activities that your daughter might enjoy. Thanks so much for reading! Thank you for responding! I have bookmarked your page as well as lemonlime adventures. Looking forward to gaining more insight and ideas. Hey ladies! Great post! I am linking to it for my next post on my DIY sensory table! Thanks, Chanda! We can’t wait to see your post! Can I link this W sitting to my center’s blog? 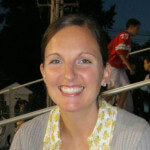 Hi Karilee….thank you for stopping by and commenting! Please feel free to share anything from us on your blog. If you would, please just leave a link back to us! Enjoy your week!! I have a 5 year old who doesn’t like to touch paints with his hands, it’s yucky. He also has a hard time eating noodles of any kind, can’t tolerate bananas or avocados (he breaks out!) and is a very picky eater, always has been. We live on a farm, so playing outside in the mud and dirt doesn’t bother him, but inside is a different story. Could he have some sort of sensory processing problem going on? Thanks so much commenting, we also homeschool. Thanks for your comment! It’s good to hear that your son is able to tolerate some tactile sensory experiences like playing in the dirt and mud – a farm is just about the best place in the world for sensory play and sensory exploration! :) I would make note of your son’s sensory aversions (picky eating and difficulty tolerating messy activities) at your next visit to the pediatrician just to make sure that you’ve expressed your concerns and that they’re documented. This way you have a record in the event that your son’s behaviors change in the future. In the meantime, you can also click through and check out our post about the Tactile System. There is a lot of useful information there that might help you learn a little more about your son’s behaviors. We also have a post about Sensory Red Flags and When to Get Help that might be interesting to you. Hope this helps! If he breaks out at avocados and bananas, I would get him to an allergist. They are both cross-reactive with latex and can become serious quickly. Hi Kim! We would definitely recommend taking a look at our book, Sensory Processing 101! There is a whole section of fun sensory activities that might fit the bill for your little guy! 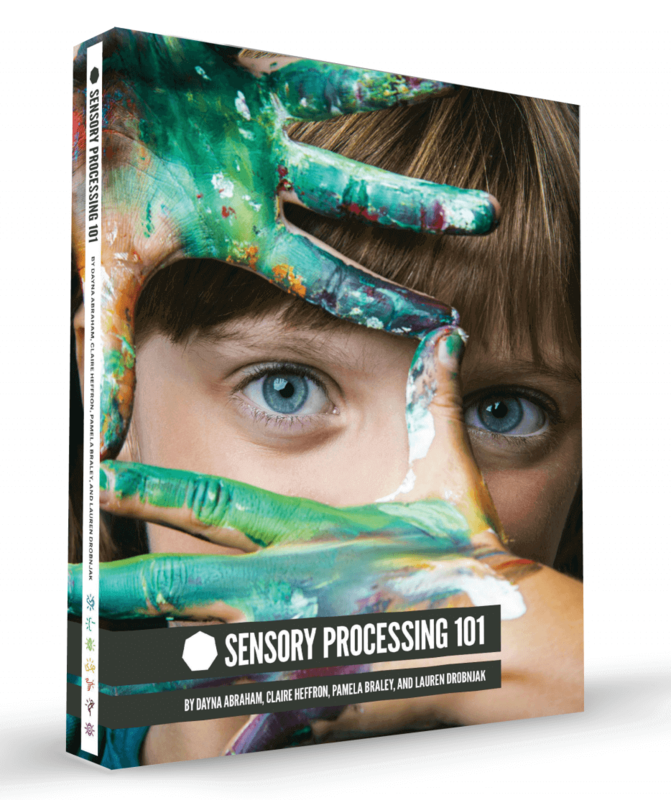 In fact, if you feel like you have a pretty good handle on sensory processing, you can purchase JUST the activities section of the book :) You can find it at sensoryprocessing101.com. Hope this helps! Fantastic! So much research still needs to be done in the medical world on sensory processing and this doesn’t help the general population develop a good understanding of it. As with many things, so much of the educational burden falls on teachers, therapists, etc. I’m so glad you’re bringing some attention to these myths so that knowledge of sensory challenges can grow.